In contemporary times, the purse has become an essential part of every modish woman's fashion statement and is no more limited to just being something to carry along your money or your make up essentials; it's much more than that. Whatever the occasion, Jute Purses are now a fast catching trend that is spreading in all young women and are one of the popular types of Jute Bags. On some special occasion, women often wonder what would they team up along with their attire. Generally, people will vouch for a designer jute purse but personally, I would like to point towards an absolutely different product. Why not something as unique and radically distinctive as a Jute Purse? Yes, why not? It's cheap, eco friendly and if you know how to select the right one, it is going you set you apart and make you stand out among the plethora of Coach, Gucci, Fendi, Prada, Dolce, Versace, Chanel, Louis Vuitton or Kate Spades out there. 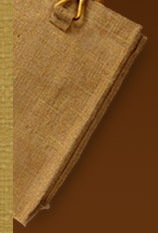 Jute is haute and is no longer the coarse brown fabric used just for packaging. 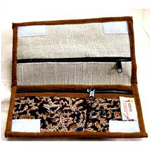 Being eco friendly, reusable, bio-degradable and inexpensive, these eco friendly ladies purses are gaining astronomic popularity of late. Today, this coarse rough fibers get alluring shapes in the humble hand of master craftsmen and artisans. A dash of colors, a designers concept, and you have the perfect purse, to compliment your persona and style in any occasion, whether be casual or formal. Owing to the rise of popularity in the recent years, both the domestic and the international market for jute is catching up and a number of retails outlets have mushroomed. Apart from these, the internet is also filled with various e-commerce sites dealing in eco friendly jute purses and products.